On 7 November the activist monk Luon Sovath, MEA Laureate of 2012, spoke to Radio Free Asia about his work. Fresh from receiving the “Nobel Prize for Human Rights,” Cambodia’s technology-savvy activist monk Loun Sovath has called on authorities in his country to end the use of violence in land eviction cases, vowing to continue his struggle to protect victims of land grabs. He also said he would not be cowed by government harassment and called on his fellow monks, often respected as figures of moral authority in Cambodia, to join in the struggle to defend villagers who have become victims of forced evictions. Loun Sovath was the first Southeast Asian to be presented with the 2012 Martin Ennals Award for Human Rights Defenders as he was selected for documenting the struggle of land rights activists and ordinary citizens evicted from their homes in his impoverished country. The monk collected the award—viewed by many as the Nobel Prize for Human Rights—in Geneva last month. “The Buddha advised people to do good deeds both physically and mentally,” he told RFA’s Khmer service during an interview in Washington on Wednesday. “Respecting human rights is a good deed which will lead to peace and prosperity for this world and in the next. So for monks to become rights defenders is nothing against Buddhism, but can lead to enlightenment and peace.” “Monks play a vital role in society. I appeal to monks to rise up to follow in the Buddha’s footsteps,” he said. Loun Sovath said the Cambodian people must also rise up to demand their rights, highlighting land disputes as the one of the biggest issues facing the public in the country. “The authorities must stop using violence against innocent villagers who are the victims of land grabbing,” he said. Research by Cambodian rights group LICADHO shows that some 2.1 million hectares of land has been given to private companies in the form of land concessions over the last two decades. The massive transfer has led to countless forced evictions and affected over 400,000 people in the 12 provinces that LICADHO monitors since 2003 alone, the group said. Sovath is currently touring the U.S., meeting with the Cambodian community and addressing various nongovernmental organizations on the human rights situation in his country. He began his nearly two-month visit last week in New York, traveled to Washington, and arrived in Chicago Thursday. Sovath said he was honored to receive the Martin Ennals Award. “I was given the award because I have worked as a rights defender and a protector of social justice involved with land issues, forced evictions, and the protection of natural resources and wildlife,” he said. In June 2011, the New York-based Human Rights Watch awarded Loun Sovath with the Hellman/Hammett grant for his work supporting communities facing forced evictions and land-grabbing in Cambodia. Years of activism Sovath first became involved in human rights work in 2009, when members of his family were injured during a police shootout at unarmed villagers in a land eviction case. The monk’s brother and nephew were wounded in the standoff, which he documented in a video. He is known for his extensive use of video to inform the world about his confrontations with authorities, earning him the nickname “multimedia monk.” The monk is rarely seen without a mobile phone or tablet. He also uses songs and art to spread his non-violent message of defending human rights. Loun Sovath said he strove to protect human rights in the interest of his country. “I have a desire to help build Cambodia,” he said. In June, Loun Sovath was briefly detained by Cambodian authorities and accused of “causing instability” after he joined protests against the jailing of 13 women over a long-running forced land eviction case in the capital Phnom Penh. 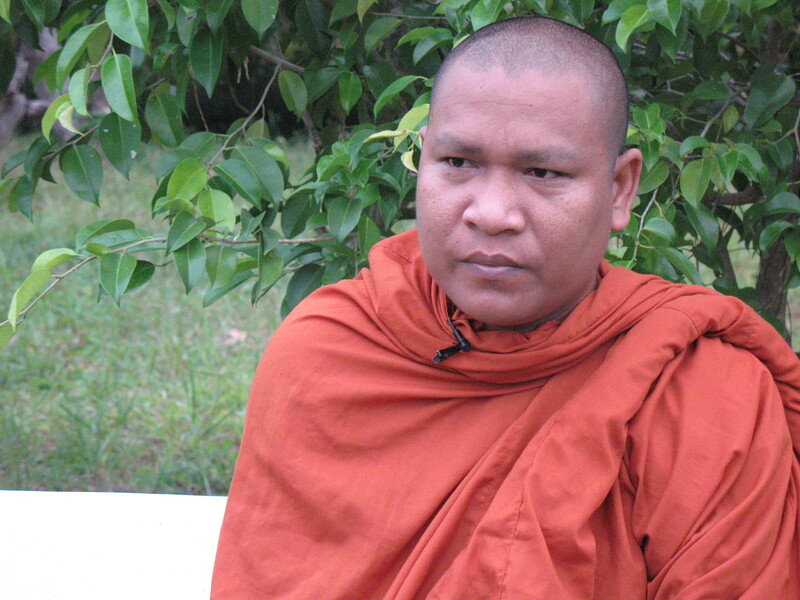 Municipal monk officials threatened to have him defrocked as a monk, but released him after he put his thumbprint on a statement assuring that he will not join future protests. Loun Sovath had been banned in April from entering pagodas in Phnom Penh after he participated in land protests. The 2012 nominee of the Martin Ennals Award for Human Rights Defenders, the ‘multimedia’ monk Luon Savath, was this morning ‘arrested’. In fact, senior members of the monastic community were involved in detaining him after he took photos of protesting Boeung Kak lake villagers outside Phnom Penh municipal court. As can be seen on http://youtu.be/0sG6iLwj95o, some monks, police and unidentified plain-clothed men forced him into a Land Cruiser and ushered him away from the scene as more than 60 protesters, flanked by about 100 police, called for the release of 13 Boeung Kak women who where being questioned inside. The Venerable Loun Savath was already banned from all pagodas in Phnom Penh last year by Supreme Patriarch Nun Nget. It seems that the Venerable Loun Savath was driven to Pagoda Botum, where police and officials from the Ministry of Interior and the Ministry of Cults and Religion barricaded him inside, sealing off entries so even pagoda boys could not enter. According to Buddhist internal rules, a committee of monks needs to meet and express whatever they think he has done wrong, then the monk in question is supposed to be able to respond to committee. Afterwards, the committee can decide to ‘advise’ him of ‘misconduct’ or ask ‘permission’ to defrock. With unusual and uncommon speed this has happened all within the same day! Luon Savath was able to make one call and then his mobile phone was cut off and no one has been able to reach him since. There is serious reason to worry and the international community should be mobilized. To stay up to date check with Twitter @witnessryan. Today the nominees of the Martin Ennals Award for Human Rights Defenders 2012 are announced in Geneva. The ann0uncement was made by the new Chair of the Martin Ennals Foundation, Mrs Micheline Calmy Rey, until last year the President of and Minister of Foreign Affairs of Switzerland. Each nominee deserves its own post! One of the 3 nominees is the venerable Luon Sovath from Cambodia. In Cambodia forced evictions remove families from their homes and lands with little or no notice, without genuine consultation, and often without compensation. Despite threats of violence, arrest and disrobing, the venerable Luon Sovath, a non-violent, innovative human rights defender, firmly supports and documents at-risk rural and urban communities, mainly by advocating to stop forced evictions, documenting their struggles with videos (the venerable Sovath is also known as the ‘Multimedia Monk’ as he is never without his camera, his mobile phone and his laptop), poems and songs, defending their right to housing, as well as for adequate compensation and alternative housing, organizing public forums to educate communities on how Buddhism, human rights and democracy are in the same line. His peaceful, non-violent approach (the venerable Sovath also composes songs to unite and inspire – regularly distributing the songs on CDs to the communities) is crucial in the nascent grassroots mobilization of affected communities nationwide; his increasingly prominent role has drawn the reaction of the authorities, and his advocacy against forced evictions touches powerful economic interests. The threats against the venerable Sovath are very real, from powerful businessmen, from the authorities and even from some of the conservative clergy.